Seen on AwardsDaily, I simply have to share these two incredible items with y'all. 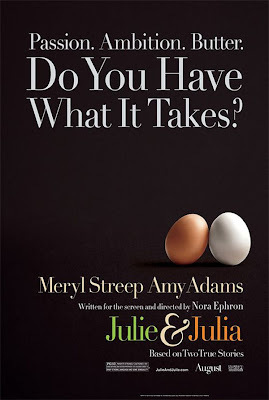 Yay, poster for Julie & Julia! If you recall, Julie & Julia was my Number Nine most anticipated film at the beginning of the year. Looking back at that list now, though... I mean, Wolverine? Really? Oh, I love Michael Caine. And this kid rocked in Son of Rambow. Can't wait for this one, either. Old people and magic and Michael Caine (did I say that yet?)! Hooray!